Picking up where we left off in part one, I'm going to continue taking a look at the main show area of the Japfest '11 show at Castle Combe. 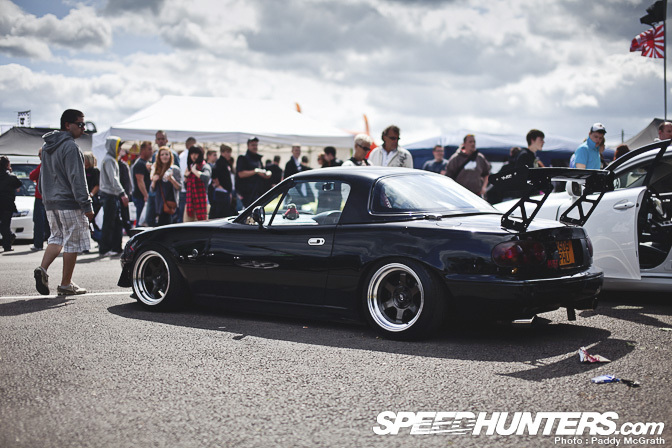 This aggresive looking MX5 attracted quite a lot of attention. I've grown quite fond of these Mazdas in recent times but I reckon due to my, uh, generous size, I might struggle to get behind the wheel of one. 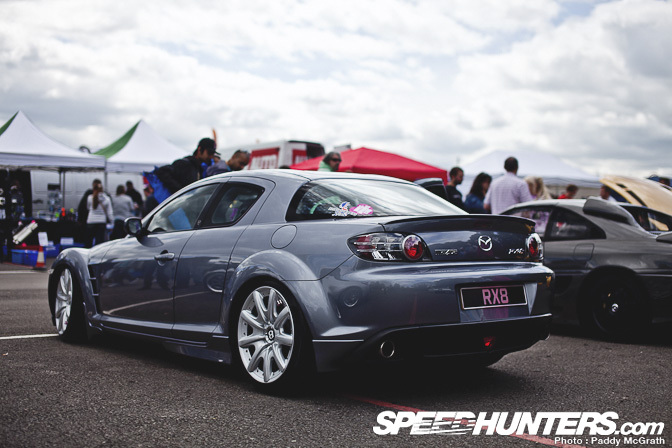 Bentley wheels looked great under this RX8. R34 Skyline on Work Meisters looked tough ! N2 arched Trueno reminds me just how much wider D-Mac's '86 is ! DC2 Integra Type R – still on my list of cars I need to own one day. Evil looking Impreza on Rota Grids. … along with this incredible Aristo. Full spotlight later in the week ! 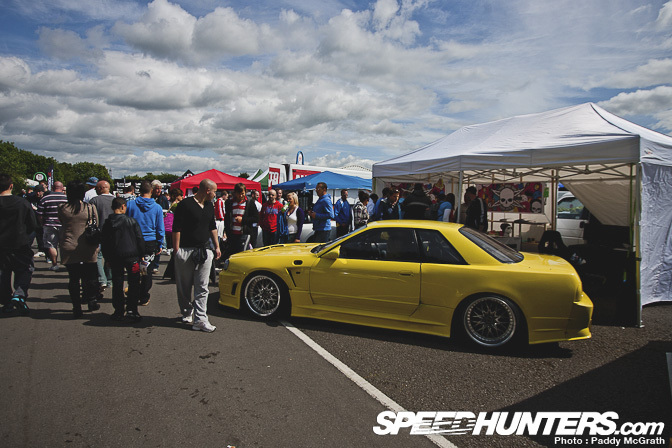 I finally managed to catch up with Bryn Alban and his Work Rezax wearing Bee*R kitted R32 Skyline for a feature after the show. His car was part of the Touge Automotive stand which was insanely busy any time I managed to get near it ! Veilside kitted RX7 on the Aerokits stand stood out from the crowd. Latest generation MX5 with painted Calibre Vintage wheels. Walton Smith's RB25 powered Impreza was looking fresh after a winter rebuild. I'm loving its new wide arched styling. Matt Neal's BTCC Civic was on display allowing fans to get up close and personal with the car. 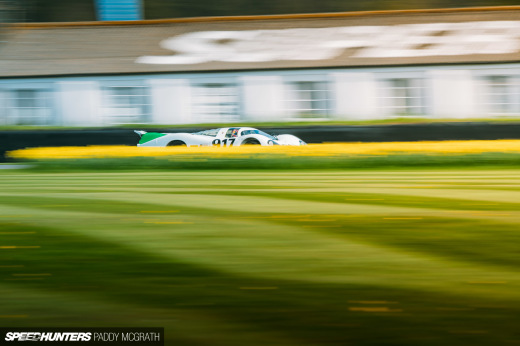 I'll be back again shortly with the final part of the show coverage before we delve into some of the on-track action and a closer look at some of the cars present. RB in an Impreza -____- , major dislike for that. these photos would be great if they werent so underexposed!! Spotlight / Feature on the MX5 from irst picture, please. I#m seriously addicted to this car! 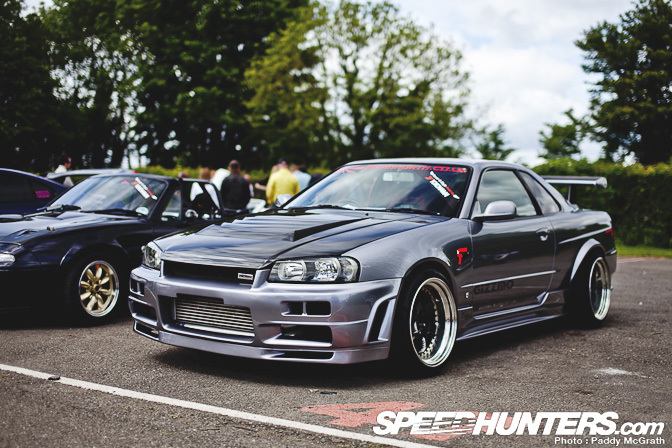 That silver R34 just looks as if somebody stole it's R34 mojo. I can't wait to see the spotlight on the Aristo. 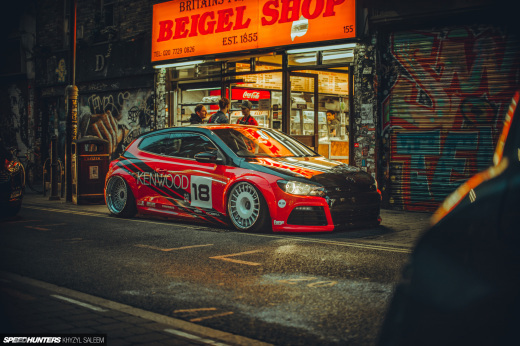 never thought i'd see Bentley wheels on a RX8, this effort was top notch.. as was the Integra DC2 Type R in yellow - wicked. really liking that Subaru Impreza sitting on those Rota Grids, cool reg. plate too. all in all, looks like a great event, plus i'm really starting to like those MX5/Miata's. 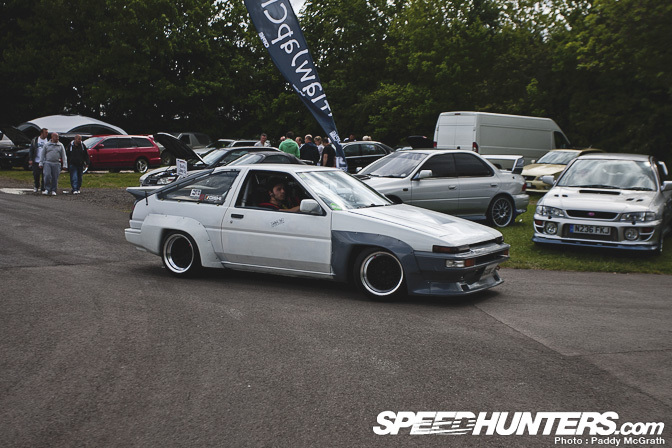 good coverage of the show, papped a pic of my trueno haha! the show seemed a bit lacklustre compared to the last few years though, not as many standout cars on show or on track. The R34 which was short lived on track was immense though! RB in an Impreza....... should never even have been thought of. i wish i was in the u.k! i've been trying to get ahold of touge automotive for like the last month via e-mail. still haven't heard anything. 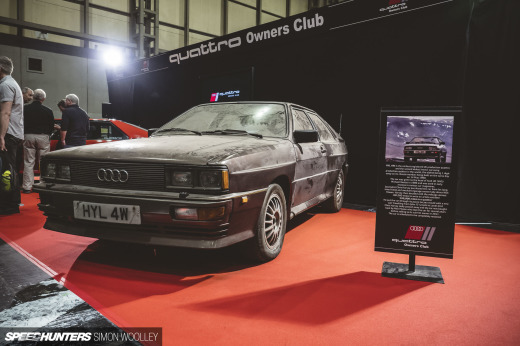 @ Jamie Johonston: It's Drifter. build by japperformanceparts.co.uk/ Its a "special" japanese build. with the Evo V front bumper, 22B arches, RB engine, and the GC8 shell. Its a weird combo but -I belive- it works. Good Lord, Wallpapers for the NA6 and the Bug Eye please. quality post sir, Quality post. Some stunning cars on show. Did you manage to snap any AW11 MR2s? rb on impreza? wow. very unusual, never seen a rb on impreza before, he's the first1. NA6's have caught my eye as well. due to what seems like a rising trend in Miata's styled similarly to the one in the opening pic. Anyone else notice this trend? Also, any Pics of the MR2 behind that RX8??? please can someone tell me what the homer simpson saying that this sticker? "Mr. Sparkle is a magnet for foodstuffs...he will banish dirt to the land of wind and ghosts". At least that's what i found on wikipedia (title of this The Simpsons episode: In Marge We Trust).